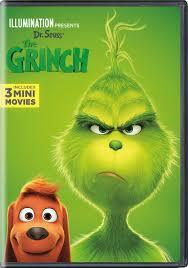 My DVD pick of the week is “The Grinch,” which I reviewed for rogerebert.com. The visuals are delightfully Seussian, all curves and slants. I loved the mitten-shaped windows on one of the houses and the way that Whoville’s Christmas decorations make it look like a captivatingly intricate gingerbread village. In contrast, the Grinch’s mountain top lair is bare and cavernous, empty and solitary, far from the warmth of the Whovian homes. While this is not especially inventive, there are some clever parallels as the Grinch and Cindy Lou each have to come up with a plan for Christmas Eve. They write out their schemes with the same two words alone on a huge surface: “Santa Claus.” And both must assemble helpers and equipment without anyone finding out. The smaller details are the most fun, especially when the Grinch brings on an enormous, yak-looking reindeer named Fred to pull his fake Santa sleigh. Or when a relentlessly cheery Whovian (Kenan Thompson) with the fanciest Christmas decorations in town keeps insisting that he and the Grinch are best friends. The Yeti, sometimes known as Bigfoot or the Abominable Snowman and akin to Sasquatch, is a mythical, or, shall we say, so far unproven creature of enormous size, something like an ape. 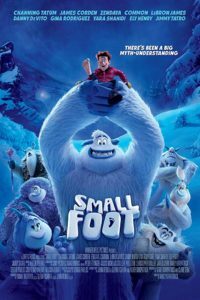 “Smallfoot” takes a charming switch-up — here it’s the Yeti who don’t believe there is such a thing as humans — and turns it into a surprisingly thoughtful film. In between its colorful musical numbers, silly jokes, and action scenes, somehow manages to address some pretty big and complex issues like fake news, xenophobia, and personal integrity, and to do so in a manner that is accessible and nuanced. Migo and Dorgle have the very important responsibility of ringing the morning gong. With Dorgle’s head (explaining why it is so flat and he is so short). Each day, Migo launches his father like an arrow through a sort of giant bow. He dreams of someday having the honor of getting launched at the gong himself. 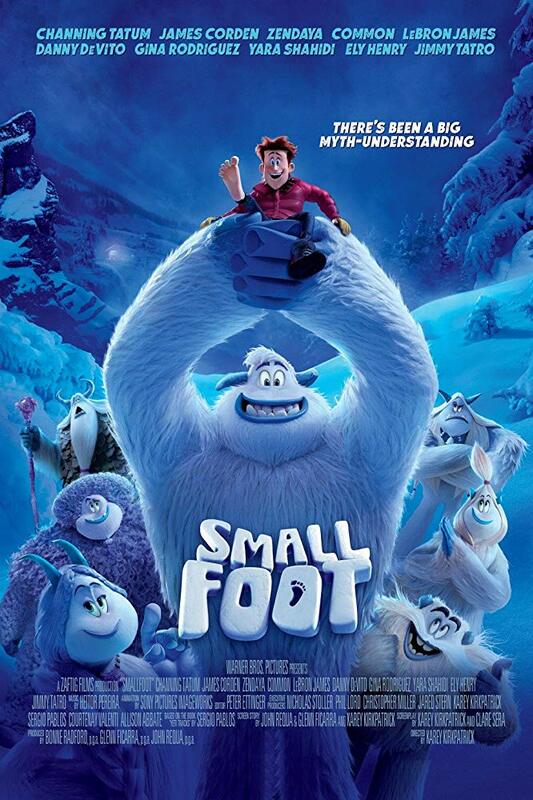 He finally gets his first try, but misses the target and ends up out in the snow, where he witnesses a plane crash and sees a human, what the Yeti call “Smallfoot.” The pilot sees Migo, too, and is equally surprised and a lot more scared. No one believes Migo, and when he insists that he is not lying about what he saw, he is banished by the Stonekeeper. That is when he discovers a kind of Yeti Resistance movement, led by the Stonekeeper’s spirited daughter, Meechee (Zendaya). She believes in curiosity, exploration, challenging assumptions, and testing hypotheses: “Questions lead to knowledge, and knowledge is power.” Migo sets off to go beneath the clouds in search of Smallfoot. Below the tree line, a British television personality named Percy (James Corden) is “under pressure” (he performs a Karaoke version of the song) because his once-popular television programs about animals have been eclipsed by amateur cute animal videos on YouTube and Facebook (the musical number features floating Facebook “likes”). He tells his colleague, Brenda (Yara Shahidi) that he plans to fake a Yeti sighting, and then go back to having integrity afterward. But then Migo, a real Yeti, shows up. Migo wants to take Percy back to his community to show that he was telling the truth. And Percy wants to film Migo so he can make a lot of money. Amusingly, they have no way of understanding each other’s form of communication. We hear what each of them sounds like to the other, Percy’s little squeaks and Migo’s growls. Migo wraps Percy in a sleeping bag, wears him on his huge hairy chest like a Baby Bjorn, and begins to climb back up to the peak of the mountain. This is where most movies for children start to move toward the themes of friendship, home, and believing in yourself. But “Smallfoot” goes in a different direction, somewhere between “The Matrix’s” blue pill/red pill choice between being safe and knowing the truth and “Black Panther’s” choice between isolationism and, despite the risks, finding a way to help and learn from others. Migo learns the reason for the Stonekeeper’s insistence on perpetuating the myths of the Yeti world, and he has to consider carefully whether it is worth putting his friends and family at risk in order to learn the truth. This is some pretty existential stuff. “If I’m not the gong ringer, who am I?” Migo asks. 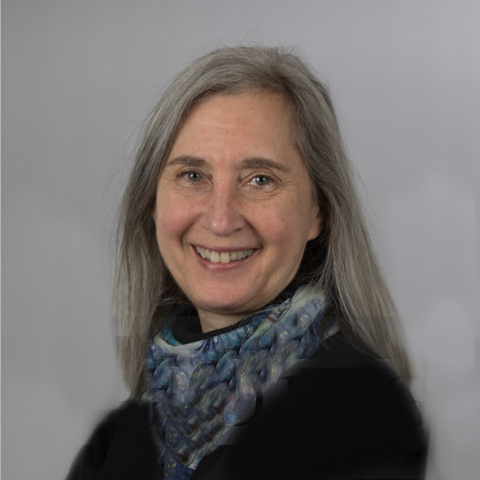 It is heartening in this era of fake news, when it is tempting to outsource our knowledge base to our devices, to have a movie about curiosity, critical thinking, and challenging the status quo. Parents should know that this movie has some schoolyard language, brief potty humor, action/cartoon-style peril (no one hurt), and discussions of past violence. Family discussion: When did you find that curiosity led you to something you would never have expected? Why didn’t the Stonekeeper want anyone to know the truth? Who should decide what knowledge is available? You can’t become a child again. But you can reconnect to the child who still lives within you, and when you do, it means even more because you know how precious it is. That is not just the theme of “Christopher Robin.” It is the experience of watching it. Enchanting production design from Jennifer Williams and cinematography from Matthias Koenigswieser make the 100 Acre Wood the place anyone would love to do nothing in. 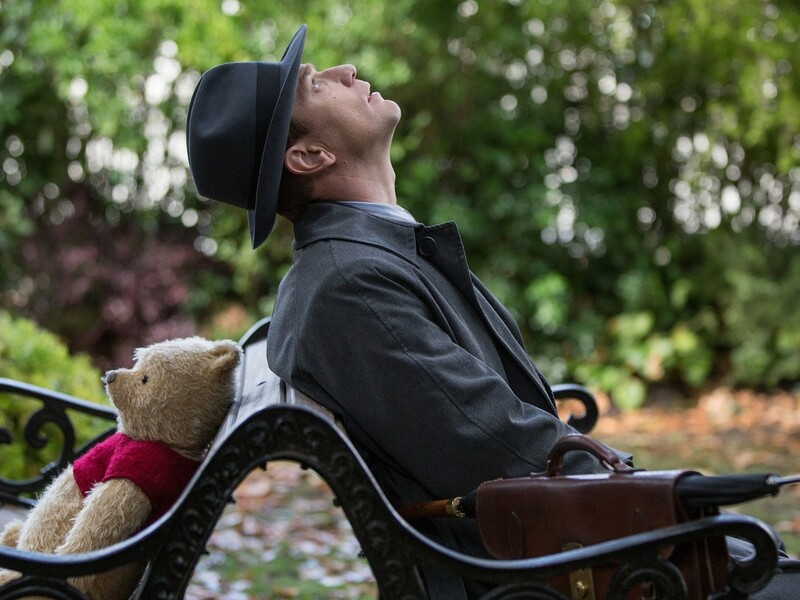 Last year year we had the very disappointing “Goodbye, Christopher Robin,” a sour and unfocused film about the Milne family, the traumatized father, the distant mother, and the unhappy child who inspired the classic Winnie the Pooh books. This fantasy is far truer to the spirit of those books, and a most welcome late-summer pleasure. Those who know and love the books will be happy with the fidelity to the stories and characters. Those who do not know them will enjoy the film and, I hope, be inspired to read the books as well, and check out the Disney animated stories. For those new to A.A. Milne: there are four books, two chapter books and two of poetry, about the life of young Christopher Robin (Orton O’Brien), and his stuffed toys, especially his best friend, a “bear of little brain” and unquenchable thirst for honey, Winnie the (or ther) Pooh, known affectionately just as Pooh. With his friends, the anxious Piglet, the gloomy donkey Eeyore, the devoted kangaroo mother Kanga and the baby she carries in her pocket, Roo, the bossy Rabbit and the occasionally wise Owl, he lives in the Edenic Hundred Acre Wood, where there is always time to pleasantly do nothing at all. But the sad fact is that children grow up. “The day finally comes as it does to all children, to say good-gye.” Christopher Robin is being sent to boarding school. He has one last tea in the woods with his friends, and then he’s gone. We follow his story with Ernest Shepard-like illustrations that match those in the books, but it is idyllic no more. Christopher Robin’s father dies. He grows up (now played by Ewan McGregor) and falls in love with Evelyn (Hayley Atwell), but he is at war when their daughter Madeline is born. And then he is home, working as an efficiency expert in a luggage company that is feeling a post-war pinch, and he is under enormous pressure to cut costs. He is affectionate but distracted and neglectful. When Madeline (Bronte Carmichael) asks for a bedtime story he picks up the nearest book and ends up reading to her about the industrial revolution. Then he lets Evelyn and Madeline down again by telling them he cannot join them on a weekend in the country because he has to work. And then Pooh shows up in London (voiced by Jim Cummings, who also provided the endearing slightly husky voice for the Disney animated Pooh). He needs to be taken back home to find his friends. Christopher Robin (called Christopher by his wife and Robin at work) packs his paperwork in his briefcase (and his brolly, of course), and takes the train, shushing Pooh and trying to find a way to cut twenty percent out of the company’s expenses. Christopher Robin has to rediscover the pleasures of, well, pleasure before he can share it with his daughter, and it is pure pleasure to see McGregor’s face shine with the joy of remembering how to play. For all of his worry about taking care of everyone at the office and at home, he was doing poorly at both. His stuffed friends teach him how to take care of those you love with patience, by listening to them to understand what they really need. If his solution at the office is half “Mary Poppins” and half slightly skewed Keynesian economics, by then we are so sweetly beguiled, that seems just right. Parents should know that this film includes comic peril and mayhem, reference to death of a parent, and brief wartime battle scenes. Family discussion: Which questions from Pooh made Christopher Robin change his mind? Ask everyone in the family to describe a toy that they loved. What comes from nothing? Try playing “Say What You See” and see how different people’s answers are. One of the best ideas in the original was giving each family member a heightened version of the real-life superpowers we see in all families. The dad is Bob, otherwise known as super-strong Mr. Incredible (Craig T. Nelson). Mom is Helen, who is always stretched in a million different directions, Elastigirl (Holly Hunter). The middle school daughter, Violet (Sarah Vowell) is invisible, because middle school is such a fraught time that many kids either think they are invisible or wish they were. And her younger brother is super-fast Dash (Huck Milner). There’s also a baby named Jack-Jack, who in the last film had not developed any superpowers yet, but in this sequel makes up for lost time with at least 17 of them. We begin right where the first film left off. Even though they just saved the day, superheroes are still outlawed by a government that considers them too much of a risk. Violet has finally been noticed by the boy she likes. And a new super-villain, The Underminer, has attacked the town. 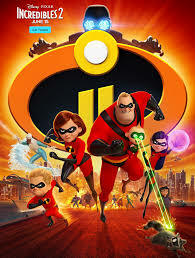 The Incredibles save the day, but it does not change the law. “Politicians don’t understand people who do good only because they think it right.” Even the secret government program to keep the superheroes saving the day is shut down. The Incredible family has no place to go…until a pair of siblings who head up a huge corporation make them an offer. They think they can persuade the government to change the law, but first Elastigirl — and only Elastigirl — will have to come with them. The movie’s funniest moments come when Bob is left behind with the kids. He may be able to lift a locomotive, but new math is an entirely different problem. And Jack Jack’s new powers start popping out like jumping beans. The concept of baby-proofing a house takes on a whole new meaning when it isn’t the baby you’re trying to protect. It’s the house that needs protection when a baby has laser beam eyes, invisibility, and a mode that can only be described as fire-breathing gorgon. He may not be able to walk or talk yet, but a raccoon who won’t leave the yard will be very sorry about making that mistake. DVD Extras include concept art and a new feature about Edna Mode. NOTE: Pixar continues its track record for making parents in the audience cry, this time even before the feature begins. The short cartoon before “Incredibles 2” is the story of a mom who just is not ready for her son to grow up and, I’m sorry, I must have something in my eye. Parents should know that this movie includes an offscreen murder of a parent with a gun, extended action/superhero peril and violence, characters mesmerized and forced to obey, and brief mild language. Family discussion: Which is more important, selling or designing? When should you be a cynic and when should you be a believer? What are your core beliefs? Win a copy of “Jonah: The Musical” on DVD! This is the adventure of a man who ends up in the belly of a giant fish and has to find his way home, with some lessons about forgiveness, grace, and mercy. Send me an email at moviemom@moviemom.com with Jonah in the subject line and tell me your favorite body of water. Don’t forget your address! (U.S. addresses only). I’ll pick a winner at random on November 18, 2017. Good luck!